Tip: When you’re picking out your ingredients find a food supplier that carries really fresh ingredients – nice lean lamb and tasty vegetables will make all the difference! 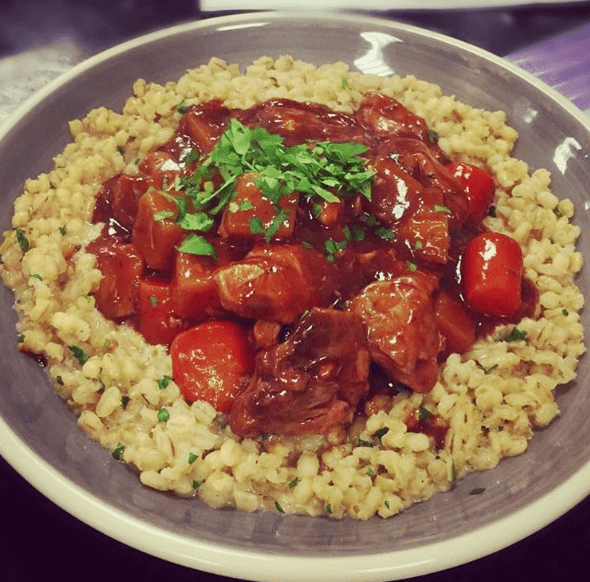 Ok foodies we’ve got a super dish for you to try this month – a traditional lamb stew with a twist! If you’re a fan of good wholesome cooking using the best food ingredients this is an extremely delicious meal for all the family. You deserve something nice and tasty after a busy week and this is the perfect recipe for the weekend or just to warm you up on a cold winter’s night. Packed full of Good Ingredients! We’re all about creating healthy, nutritious meals and the ingredients we use are of the highest quality, meticulously chosen so you’re well covered. A lot of us grew up eating lamb stews and they are a family favourite. We aren’t going to change a fabulous traditional dish and have chosen carrots, celery, onion for our veg. We are adding a little twist though and that’s a pearl barley risotto – you’ll discover the flavours are magical together. You’re going to love this recipe because it’s easy to put together and is consistently full of flavour (and it smells great too!). You’ll comfortably be able to get all your prep done in 35 minutes and then you can sit back and relax once you’ve popped it in the oven. Trim the ends off your celery and roughly chop up the sticks. Next peel your onion and carrots and again chop roughly. Prep the rosemary by chopping finely and discarding the stalks. Preheat your oven to 160ºC. Heat a heavy bottom pan on high until smoking hot, add the oil and sear the lamb in batches until there is colour on all sides, place the lamb pieces into an ovenproof dish. Next add the veg, herbs and season, sweat until the onions are translucent and add to the lamb. Deglaze the pan with the red wine and reduce by half, add the stock, sugar & balsamic, bring to the boil and then pour over the lamb. Put a layer of greaseproof paper over the lamb, put a lid on the dish and place into the middle shelf of the oven for 3hrs. Remove from the oven. Slurry the cornflour with the milk, remove the greaseproof paper, stir the slurry through, replace the lid and return to the oven for a further 30-60mins. Have stock on a low simmer in a pot with a ladle. In a separate pot heat the knob of butter until it foams. Add onion & garlic, season and sweat until translucent. Add the barley and stir until coated in butter. Add the wine and reduce until liquid has evaporated. Add a ladle of stock and cook until evaporated, repeat until barley is just past al dente. Reduce heat, add cream, parmesan, butter & parsley and cook for a further minute. Garnish your risotto with shaved parmesan and chopped mint. Keep an eye on our latest news for more recipes and great food options!